The posterior auricular artery originates over the posterior belly of the digastric muscle, and rises upwards in the groove in the middle of the auricle along with the mastoid process. The posterior auricular artery is a small vessel that originates from the carotid artery. In order to connect with the angle created from the cartilage of the ear with the mastoid process it rises up, below coat of the parotid gland, at the side of the head. The portio dura of the seventh nerve passes over it as well as the spinal accessory arcs behind it. 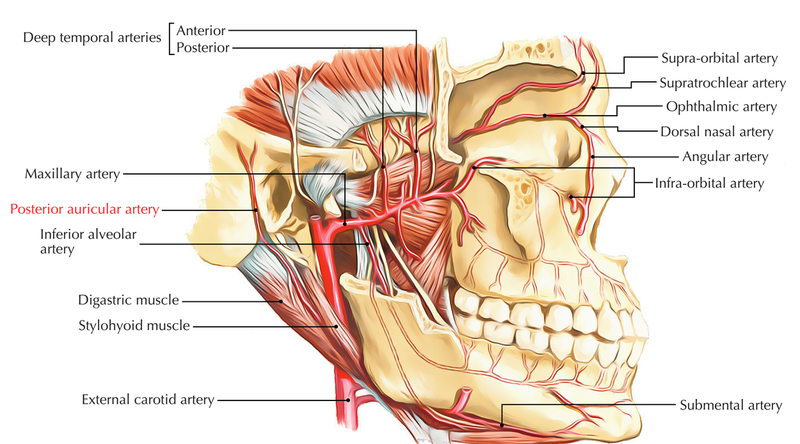 It splits into two groups of branches, of which one set slants forward in order to anastomose with the posterior divisions of the temporal artery and the other back to the occiput, on which they connect with the occipital artery a bit above the mastoid portion of the temporal bone. The occipital belly along with the scalp behind as well as above the auricle is circulated by the posterior auricular artery.